ArtFusion 19464 a federal charitable 501(c)3 non-profit organization. 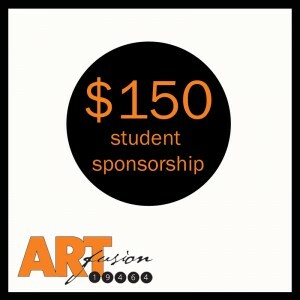 When you make a donation to ArtFusion, you help us in our mission to bring the arts to our community. To make an easy online donation, please click here. See below for other ways to support us. We have great opportunities for your business to support our non-profit community art center–and also gain some valuable exposure for your generosity. Our gallery hosts 8-10 art shows per year, including our annual educational exhibit. Each year we design and host a special educational art exhibit, choosing a topic we believe we can teach about through art. 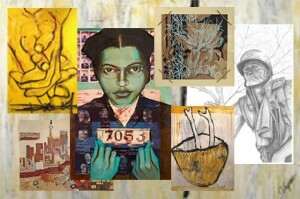 Past topics include the Civil Rights movement, the Vietnam War, art and the environment, and women in history. In conjunction with each exhibit, we offer free fields trips to local schools. If you are interested in learning more about sponsoring one of these great shows, please call 610-326-2506 or email our director Erika Hornburg. We believe every child has a right to participate in the arts. Unfortunately, there are many children in our community who do not have that opportunity. One simple way you can help is provide a student with a scholarship. For only $150, you can nurture creativity and self-expression, and start a student on a journey that will enhance their self-esteem. If you agree that the arts are an important part of a child’s life, please sponsor a student today. Your logo will appear on all of our emails to our over 2000 recipients. We normally send 8-10 emails per month on topics ranging from classes and art shows to fundraisers and free programs. $100 for 6 months. Please contact us for more information.